Building relationships is an important part of any successful sales job. Some of the most prosperous people in the business are those who can quickly build rapport, make a connection, and use that new connection/relationship to sell. Many times, however, “relationship builders” - men and women who look and sound exactly like real salespeople but cannot close - could be killing sales and revenue. The most common “Simulation Salesperson” today is the “Networker,” who seems to be self-motivating, independent, persuasive, articulate, and likable. They dress the part, seeming perfectly groomed, and talk the part, seeming confident and assertive. In fact, this person may appear to be just like your top biller. They are making calls, building relationships, digging up new leads…but they just can’t seem to close enough sales. The effect they will have on the bottom line will be anything but funny. Why don’t the Networkers work out? Unafraid of mingling with or initiating new leads, the Networker’s inherent need to make friends and charm prospects is stronger than his need to make the sale, close the deal, and move on to the next sale. Because customers might not like him if he asked them to buy, he’s often reluctant to pressure his new “friend” into making a decision now – or ever. In markets with several competitors, real salespeople who don’t hesitate to ask for the order (and view every “no” as a “maybe”) will level him. 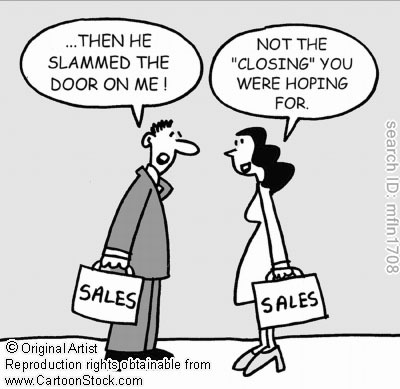 A “true” or “classic” sales person will be aggressive, outgoing, gregarious, friendly, fast-paced, and independent. People with these traits can quickly build rapport like the Networker, but then go on to sell through persuasion, creating a sense of urgency, and filling a need. They aren’t afraid of risk, hard work, or asking for the order; they live for the “win.” Sales personnel with this personality use their superior communication and people skills to convince clients they have problems that can only be solved by using your product or service. They are generally the best billers in the industry. A second “true” salesperson frequently found is the “Problem-Solving” Sales Personality. Like the Classic sales personality, he lives to win. Similar to many small business owners who ask questions and need to be “in the know,” the Problem-Solver is more fact-based than people-based. The Problem-Solver is as pragmatic and logical as the Classic sales personality is outgoing and friendly. He is more patient and persistent and follows-up until he makes the sale. For most sales positions, the “Classic” sales personality is slightly preferred, although every company needs at least one “Problem-Solver” to sell to skeptical, price-sensitive, first-time buyers. So how do you avoid hiring Networkers? What if Networkers are already on your sales team? So your AEs are out making tons of calls, building relationships, and treating dozens of clients to lunch each month. They’re offering perks to prospective buyers and chasing several new leads. But the sales aren’t coming in as expected. While Networkers typically struggle in sales, a smart sales manager can help improve the closing ratio (and improve the company’s bottom line) by focusing on this personality’s strengths. The Networker’s strengths are his enthusiastic, talkative, upbeat, personable nature and ability to get his foot in the door. Since Networkers generally enjoy meeting new people and initiating calls, make them serve as a new business contact developer. Let them initiate contact and build rapport with prospects. Then turn the account over to a more driven, aggressive individual who will actually ask for the sale. The Networker generally responds best to an upbeat, encouraging boss with an informal, “just handle it” management style. They dislike (maybe even fear) rejection, so it is important that the boss be supportive and encouraging, not harsh or unfriendly. When disciplining, be sure to critique the job performance, not the person. Set quantifiable sales goals and hold them accountable for achievement. Start with short-term goals to help build confidence and assertiveness. Role-play hard-sell situations. Meet weekly to assess progress, being sure that YOU control the meeting, not the talkative, excuse-providing Networker. The competition isn’t always the best source. The superstars often cost more than they’re worth or demand management jobs they don’t have the temperament or training to handle. If you decide to raid other industries, avoid retail, newspapers, magazines and telemarketing jobs where salespeople are more “order takers” than “order makers.” Look toward products or services that require persuasive skills and the ability to create need in order to sell. And look everywhere. Many “True Salespeople” are stuck in dead-end jobs. Along with employee behavioral assessments, interviewing plays an important role when recruiting a successful sales team. While many managers simply wing it during the interview, a little advance preparation can help you avoid hiring “Simulation Salespeople.” A well-prepared interviewer asks open-ended, behaviorally based questions to help anticipate future performance and reveal more about the candidate’s personality and workplace behavior. Is it more important for you to be respected or liked? While most people want to be liked, for the true sales personality it is generally more important to be respected and considered “a winner.” The Networker needs to be liked – above anything else. What was the last sales goal/quota you didn’t meet and why? A true sales personality will almost always meet goals or make sure they doesn’t fail again (after all, they’re driven, assertive, goal-oriented people). A Networker personality will usually avoid answering the question, dancing around the issue and blaming missed goals on anyone or anything but themself. Role-play a realistic second sales call. Again, the Networker personality struggles when it comes to closing the deal, and will likely dance around the question. Most of all, remember that a compelling need to win is what separates sales superstars from “Simulation Salespeople." That well-dressed, well-spoken candidate you’re interviewing probably isn't a real salesperson if they’re not already lusting after YOUR job and paycheck.